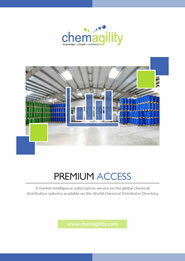 PREMIUM, the new market intelligence service dedicated to the Chemical Distribution Industry, brings rich content and dynamic functionality to the World Chemical Distributor Directory making it the most comprehensive resource available on the industry today. *MyDistributorList is an area of the MyDashboard where researched distributors can be saved for future reference. **The price of €80/month (£62.5 or $105) is based on a 12 month contract price payable annually. This can be paid on-line via Paypal or alternatively by invoice. Please note if you pay by invoice then payment has to be received by our Bank before your subscription can be activated. For more infomation please contact us. Invoice my company now for access to our PREMIUM subscription service. *Based on minimum 12 month contract price payable annually.Total payable annually = EUR 960 or USD 1,260. PREMIUM Access on receipt of payment. Pay online by credit card now for immediate access to our PREMIUM subscription service.